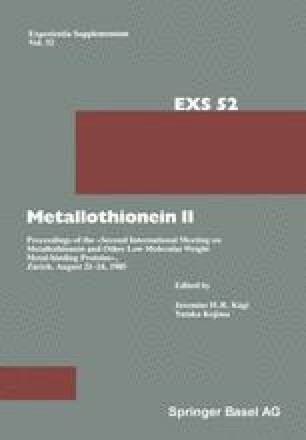 Metallothionein plays an important role in the metabolism and toxicity of cadmium. Human beings are exposed to increasing amounts of cadmium. The critical organ in long term cadmium exposure is the kidney. Some groups in the population fall within the risk zone for developing renal tubular dysfunction from cadmium exposure. After absorption, cadmium is to a large extent distributed to the liver where it is bound to and induces the synthesis of metallothionein. Subsequently metallothionein-bound cadmium is slowly released into blood and efficiently taken up by renal tubular cells after glomerular filtration. The biological half-time of cadmium in the human kidney is considered to be very long: 10–15 years and this explains the life-long accumulation of cadmium, reaching a toxic concentration of approximately 200 ug/g in excessively exposed individuals. Human adult renal metallothionein has a natural content of cadmium which also induces the resynthesis of this protein upon its catabolism. This could be one explanation of the long biological half-time which has been reported for cadmium. Injection of metallothionein-bound cadmium can induce renal tubular kidney dysfunction at lower renal cadmium concentrations (10–20 ug/g), probably because of the fast catabolism and relatively slow synthesis of metallothionein in renal cells. A model of these and other mechanisms causing tubular kidney damage in cadmium exposure is presented.